I often struggle with gift buying, kids are never a problem, they are easy to satisfy. When it comes to adults like Grandma and Grandpa they typically have received every gift under the sun and then some, so it is nice when you come across a gift that they will actually put to good use. 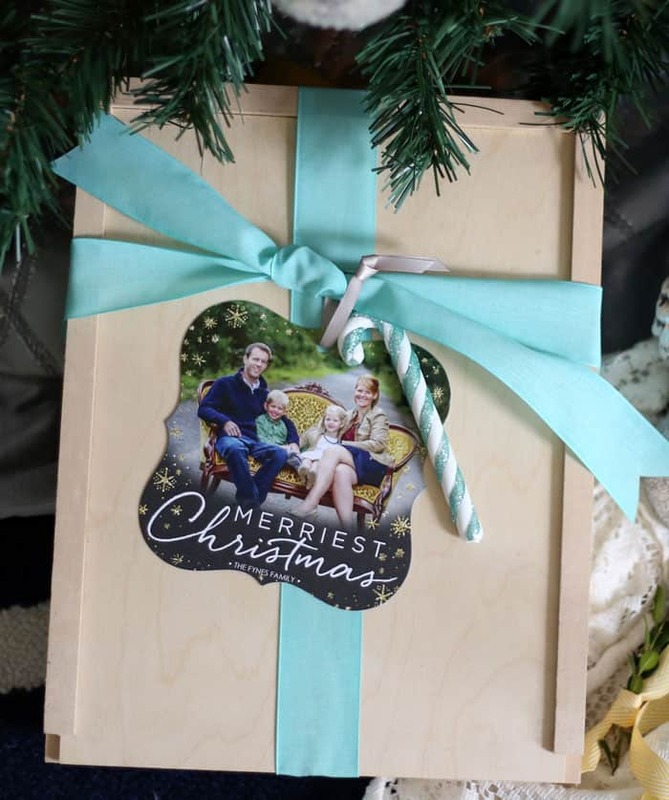 This year when shopping I came across some beautiful stationary sets on Tiny Prints and knew there were a few people I could cross off my list with these darling personalized gift sets. Putting together a unique coordinated gift set was so easy! I just choose the pattern and color scheme I desired, input a few details like name and address, and click order. 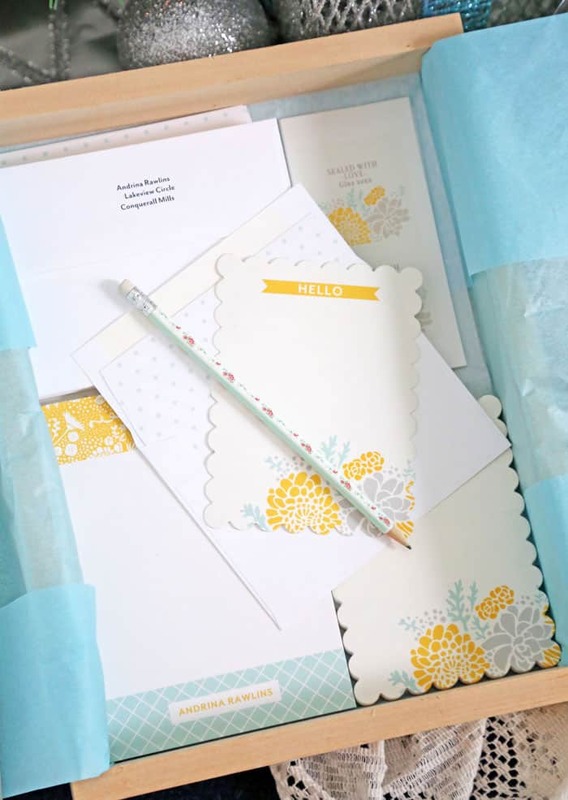 Tiny Prints offers notepads, lined notebooks, flat gift cards, lined envelopes (with or without printed addresses), seals, and address labels; all beautifully coordinated. I bet you can think of someone on your list right now these would be perfect for. 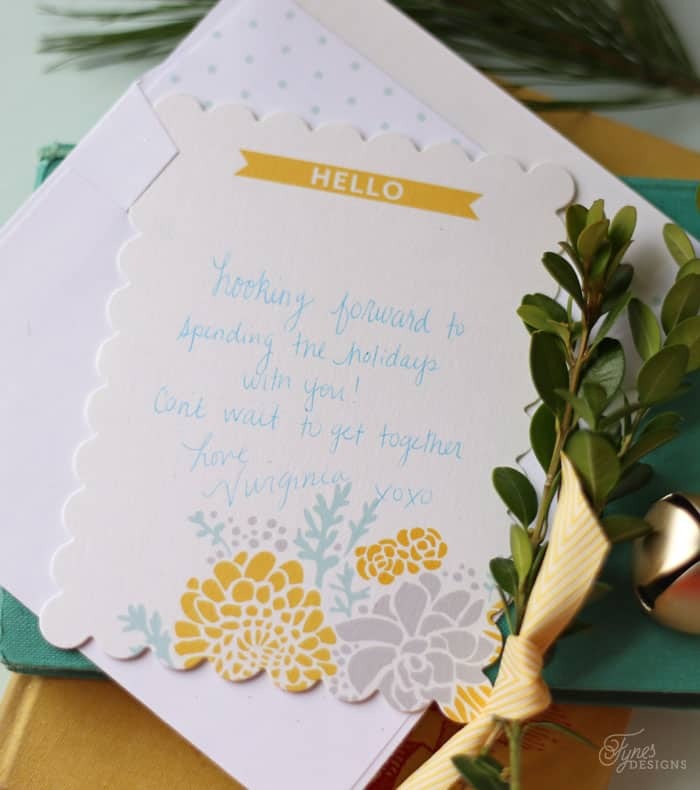 Wouldn’t it be lovely to have custom stationary on hand when the mood to jot a note to a friend struck? 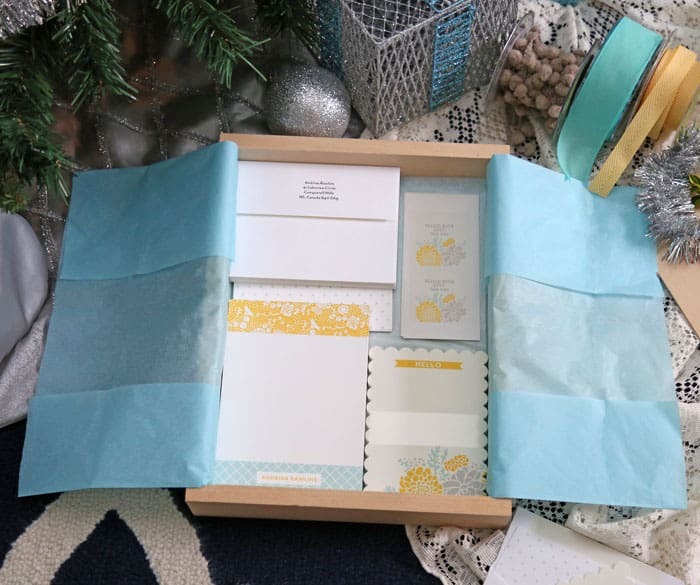 Since I’ve joined up with a group of blogger friends to talk gift wrapping today, I thought I’d share how I packaged up my stationary set to gift this holiday season. I began with a small sliding top wooden box. These can be found at certain craft stores, or at various online retailers (like this one). Then I laid a folded sheet of tissue lengthwise in the box, and a contrasting half sheet in the bottom. I then arranged the stationary pieces into the box (you may want to add in a bit of filler if you’re shipping). 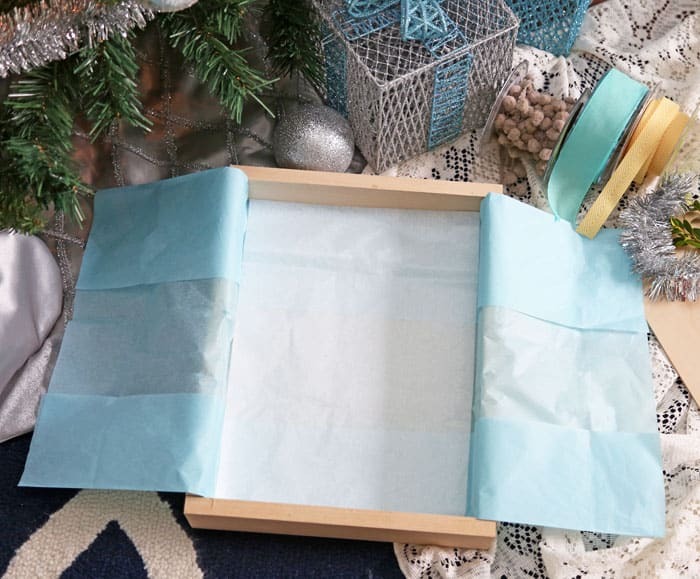 Then simply fold the tissue over to cover your sweet personalized gift, too easy! 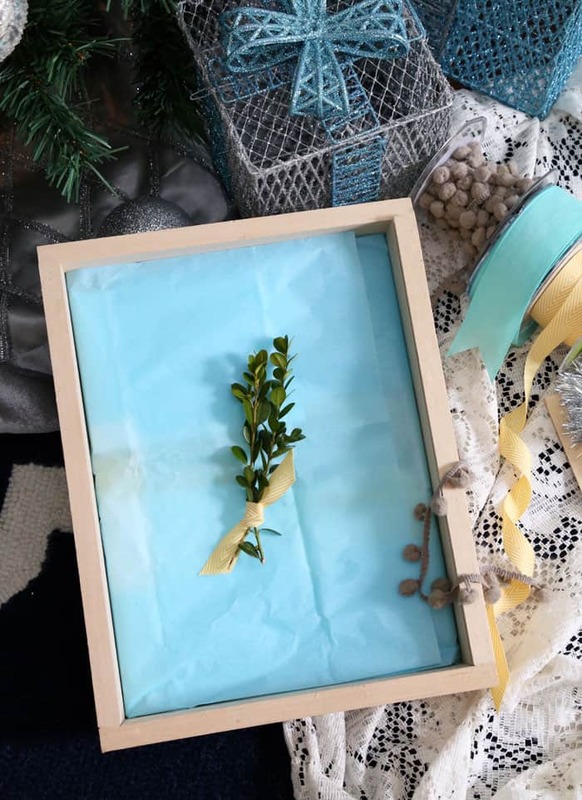 Slide the cover on the box, tie a pretty ribbon and viola your gift wrapping is complete! 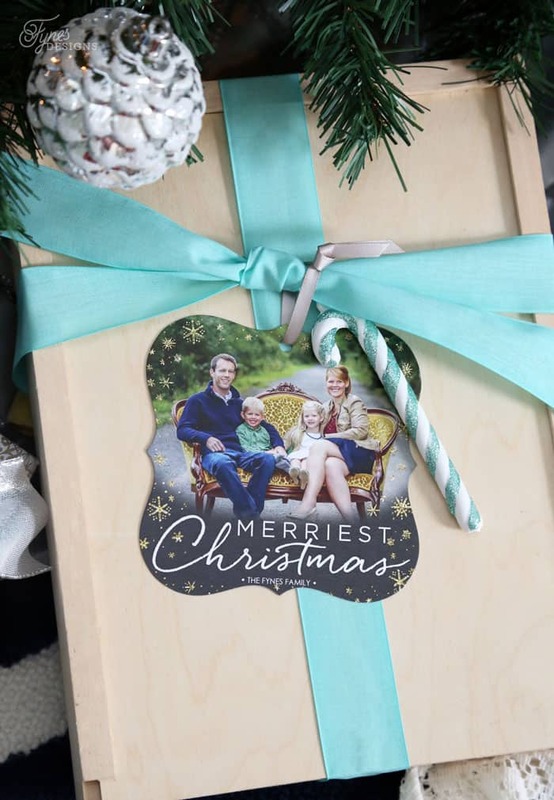 To personalize your gifts one step further, tie on a photo gift card ornament that your recipient is sure to cherish! I love how easy these beautiful boxes make gift wrapping so easy, anyone can re-create this darling custom stationary gift sets. 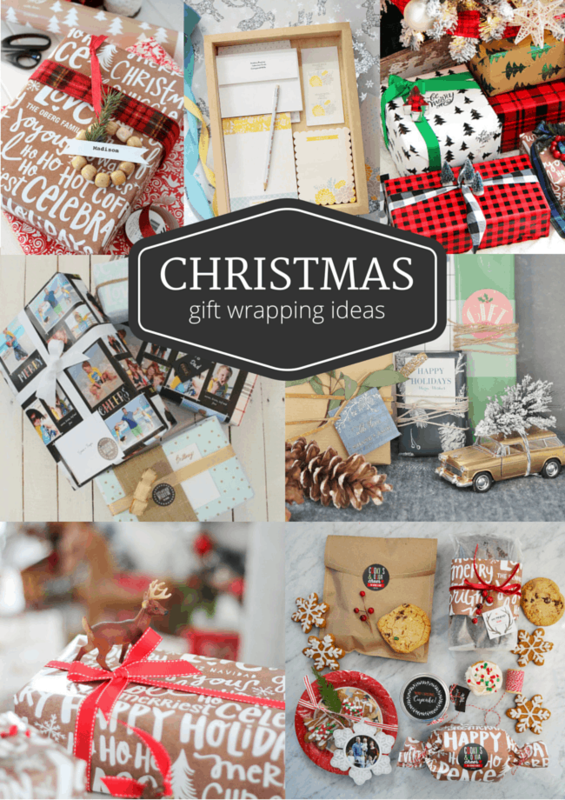 Be sure to visit Tiny Prints for all your gift giving and holiday stationary needs! Ps your wrapping is superb! Inspiring and smart!????? Thanks Anne, simple enough for anyone to recreate, but just the right personal touch! Thanks for visiting! I actually love their calendars and can’t wait to make one for next year!! I am a list maker so I love all of their little notepads. Such a beautiful set of stationary…what a nice gift that would be to receive! And great idea with the wooden box! This is such a great gift idea. Love the way you wrapped it up too. That ornament tag is such a nice keepsake! Thanks Cheryl! I think they’ll make a great gift! What a wonderful idea! I love Tiny Prints!!! The stationery is beautiful! They do have so many beautiful products! This is such a great, unique gift idea. Thanks for sharing and I LOVE your family Christmas card! So beautiful. What a wonderful gift idea! These are really beautiful, I’m sure anyone would be so happy to receive these as a gift. Thanks for sharing this wonderful idea. That would be a great idea, why didn’t I think of this! Such a thoughtful gift idea! I love the presentation…it makes the gift even lovelier! This is just a gorgeous idea and would make such a lovely gift! Happy Holidays and thanks for sharing on Throwback Thursday and I’ll be pinning this to our TBT pinterest! Hope to see you next Thursday! !